Turkey's preparations for a possible operation in Syria in the east of Euphrates continue "intensely", the defense minister said on Friday. "We have Manbij, and the east of Euphrates ahead. Necessary planning was made regarding this. Our preparation continues intensely," Hulusi Akar said while inspecting troops near the border with Syria. 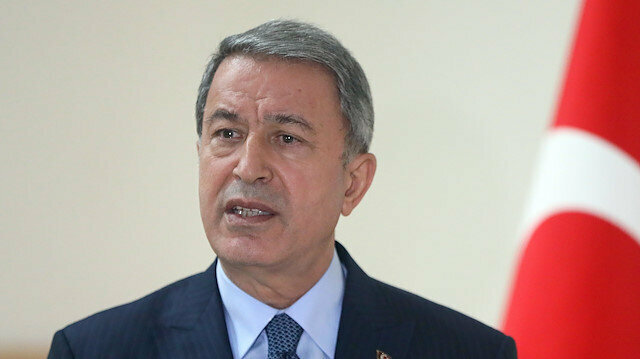 Akar said Turkey was determined to end terrorism wherever it may be. "We have no problems with our Kurdish brothers, Arab brothers in Syria, Turkmens and other ethnic and religious groups. Our only targets are terrorists Daesh and PKK/YPG," he added. A mission east of the Euphrates River, which Turkey’s leadership has been suggesting for months, would follow two successful cross-border Turkish operations into Syria since 2016 -- Operations Euphrates Shield and Olive Branch -- both meant to eradicate the presence of YPG/PKK and Daesh terrorists near Turkey’s borders. In its more than 30-year terror campaign against Turkey, the PKK -- listed as a terrorist organization by Turkey, the U.S. and the EU -- has been responsible for the deaths of some 40,000 people, including women and children. The YPG is its Syrian branch. Two opposition fighters with the Free Syrian Army were killed Thursday in Syria's northwestern when the YPG/PKK terror group targeted their vehicle with a U.S.-made anti-tank missile, said a security source.YPG/PKK terrorists fired the U.S.-made TOW missile from Syria’s northwestern Tal Rifaat city, according to the source, who spoke on condition of anonymity due to restrictions on talking to the media.YPG is the Syrian branch of the PKK terrorist network which has waged a terror campaign against Turkey for more than 30 years and killing thousands of people including women and children.The U.S. has provided arms support to the terrorist group in Syria under the disguise of the so-called Syrian Democratic Forces.The U.S. arms support for the terrorist group included 12,000 Kalashnikov automatic rifles, 6,000 machine guns, 3,500 heavy machine guns, 3,000 U.S.-made RPG-7s, and 1,000 U.S. made AT-4 or Russian made SPG-9 anti-tank munitions. The U.S. has started withdrawing military equipment from Syria, an official from the Pentagon confirmed Thursday.The official, who asked not to be named, told Anadolu Agency the removal of "some of the equipment" had begun.He declined to elaborate on the type of military equipment involved or where it was removed from due to “security concerns”.CNN reported earlier that the U.S. Central Command (CENTCOM) has identified ships, aircraft and ground units that will be used in the operation.In December, President Donald Trump announced plans to withdraw all 2,000 U.S. troops from Syria, claiming that American forces had defeated Daesh there.The move sparked criticism from many allies and security aides, including his own Cabinet.Following the announcement, Defense Secretary James Mattis submitted his resignation letter. The withdrawal is being carried out under an order signed by Mattis before he left office on Dec. 31.